Guest: Hispanic Center of Greater Danbury (or the organization that was screwed by the mayor and his anti-immigrant ilk). As you know, bloggers have been VERY critical of Gov Rell's dishonet budget proposal that she presented while knowing that it was 2 billion dollars short in terms of addressing the 2011 projected deficit. 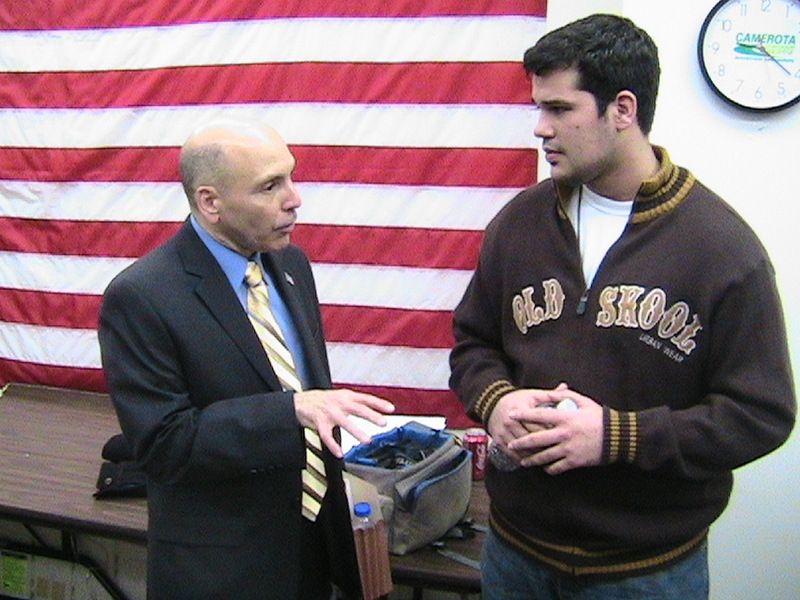 With that in mind, at Monday's Democratic Town Committee meeting, 110th State Rep Bob Godfrey took the gloves off and explained the seriousness of the governor's game of smoke and mirrors. The video is about 13 minutes but worth every second of viewing. If I said it once, I've said it a thousands times, the VIDEO TAPE NEVER LIES! Take for instance the situation in East Haven in which there are allegations of police officers harassing members of the immigrant community. Recently, a priest who stands up for the rights for immigrants for arrested for documenting the alleged abuses in the area. Now that same priest has come forward with evidence that police's accounts leading up his arrest was basically made-up. A city priest crossed into East Haven to document what he called systematic and sometimes violent police harassment of Latinos — only to find himself arrested and his camera confiscated. As the head of a parish with a growing population of newcomers from Latin America, Manship has been an outspoken advocate for Ecuadorians and other immigrants. The priest is Father James Manship, pastor of the Saint Rose of Lima church in Fair Haven. He is scheduled to appear in New Haven’s State Superior Court Wednesday morning in connection with his arrest by East Haven police. The priest’s advocacy work has recently extended across the nearby border into East Haven, where Latino business owners say that East Haven police have been targeting their customers for harassment. The business owners said that Latino customers are afraid to come to their shops, for fear of being threatened and ticketed by police officers. On the evening of his arrest, at around 5:30 p.m. on Thursday, Feb. 19, Father Manship walked into My Country Store, a convenience store in East Haven run by Ecuadorians. Inside, the police were removing over 60 expired license plates that had been hung as decorations in the store. The license plates were government property, the officers had said, and they were confiscating them. Manship entered the shop, took out a digital camera, and began videotaping the East Haven police officers who were removing license plates from a wall in the rear of the store. The officers immediately ordered Manship to stop videotaping, seized his camera and put him under arrest, according to Manship. Within minutes of his arrival, everyone in the store fell silent as Father Manship was led out in handcuffs. He was charged with interfering with a police officer and creating a public disturbance. According to the Officer David Cari, Keefe said, Officer Dennis Spaulding had approached Father Manship when he entered the store, advising him to keep his distance from the police. Spaulding had reportedly given Manship a similar warning earlier in the week. Manship allegedly walked toward the police with an “unknown shiny object cupped in his hands.” Manship stopped and “fully extended his hands” towards the officers. Officer Cari reported that he felt unsafe. He asked Manship if he was holding a video camera, asked him to reveal what was in his hands. Manship reportedly didn’t answer. “When you have something in your hand and the police ask you a simple question, common sense dictates that you answer that question,” attorney Keefe said. You can read the police report in full by clicking here (pdf file). NOW, here's Father Manship's video footage, which was released to the media yesterday...listen carefully. Father James Manship released video footage Thursday that contradicts an East Haven police report justifying his arrest. Manship and his supporters released the footage at a press event Thursday at the St. Rose of Lima Church in Fair Haven. The video, taken by Father Manship (pictured), shows the seconds leading up to his arrest. The footage appears to contradict a claim made by the East Haven police department in a police report that was withheld until 13 days after the incident. The police report, David Cari, one of two arresting officers, states that he didn’t know what the New Haven priest was holding. He wrote that he saw an “unknown shiny silver object” that Manship had “cupped” in his hands, and was afraid for his safety. Read the police report here. In the video, the Officer Cari twice refers to the object as a camera. “Sir what are you doing? Is there a reason that you have a camera on me?” says Cari, in the video. In direct contradiction of Cari’s claim, the video from Manship’s camera shows Officer Cari twice verbally identifying the “silver object” as a camera. “Sir what are you doing? Is there a reason that you have a camera on me?” says Officer Cari, in the video. “I’m taking a video of what’s going on here,” Manship replies. “Well, I’ll tell you what, what I’m going to do with that camera,” Officer Cari says, as he walks around a shelving unit to approach the priest. Who's telling the truth? I think you know that answer. Morale of the story...the videotape will always tell the story. In this case, the East Haven police's account of the incident is basically a joke by the fact that the video DIRECTLY contridicts the arresting officer's account of the incident. Brewing problem for City Hall? Allegations of discriminaton at the Danbury Hoiusing Authority have increased over the last couple of months and it now seems like the Attorney General is taking the matter seriously. After Tuesday's Common Council meeting, Charter Revision Chairman Carlo Marano and Minority Leader Tom Saadi fielded questions from The News-Times, WLAD, and yours truly. Marano was questioned about the origins of the four year term proposal (listen VERY CAREFULLY to his answer) as well as his thoughts on the entire 17 month charter revision process. I later questioned Councilman Saadi about the defeat of the four year terms proposal as well as his thoughts on the changes as a whole. As I stated earlier, based on the popularity of the online versions of the local access shows "Danbury Live" and "Community Forum", another local access host has partner with HatCityBLOG. The show "Spotlight On" features videos of various events in the Danbury area. Hosted by Bob Brought Jr., Tuesday's show focused on the Danbury Mad Hatter's "Danbury Trasher's night" game agaisnt the Brooklyn Aces. As word of East Haven police racial profiling immigrants gains attention in the media, one of the most dangerous Neo-Nazi group in the region pays an unwelcomed visit to the area. Just days after they spoke out against alleged racial profiling of Latinos in East Haven, Luis Rodriguez and city priest Father James Manship discovered frightening flyers at their doorsteps. A white supremacist group hand-delivered flyers Saturday night to Latino businesses in East Haven and at St. Rose of Lima, Manship’s church in New Haven. The flyers warn of an “invasion” of undocumented immigrants that will turn the United States into “a third-world slum.” Some of the flyers feature a picture of a soldier holding a rifle. “This makes me very nervous,” said Rodriguez (pictured), an Ecuadorian immigrant who owns Los Amigos Grocery in East Haven. He and his wife now fear for their safety. The flyers were also deposited at St. Rose of Lima Church in Fair Haven, where Manship (pictured) serves as the priest. As the head of a parish with a growing population of newcomers from Latin America, Manship has been an outspoken advocate for Ecuadorians and other immigrants. Members of the Common Council learn details of revised teachers contract. Well, the four year term nonsense is finally a wrap. Last night, the Common Council voted to approve the teacher's contract as well as axe the four year term proposal from the revisions of the charter. Although there is a LOT to talk about regarding the origins of the four year term proposal, this post will only focus on video highlights of the meeting itself as opposed to offering my opinion on what happened last night. This will be an ongoing post and will be bumped to the top as videos are uploaded. Democrat Gary Goncalves answers questions from residents at last night's DTC meeting. After his announcing his intention in front of 150+ friends and family members at the Amber Room Sunday, Democrat Gary Goncalves spoke at last night's Democratic Town Committee meeting about his desire to unseat Mark Boughton in this fall's municipal election. 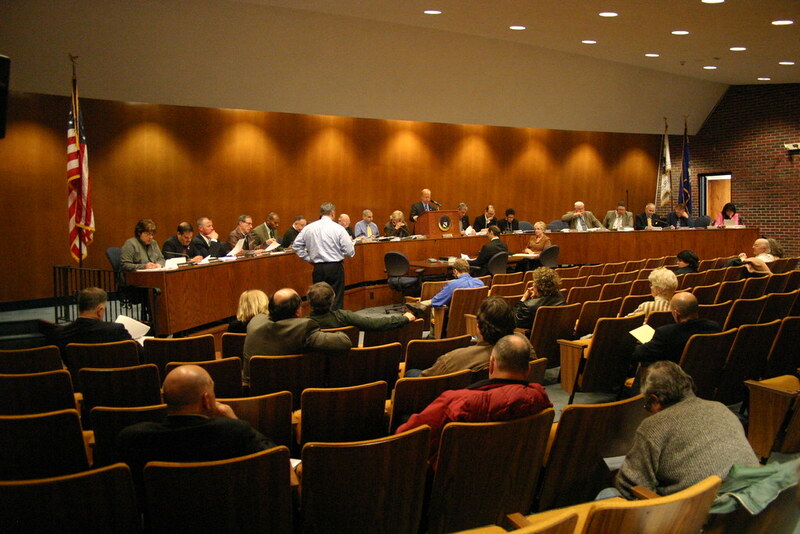 From last night's DTC meeting, here's highlights of Goncalves' announcement. The Goncalves' campaign released the following release. On Sunday, March 8th, Danbury native Gary M. Goncalves announced his intention to seek the Democratic nomination as the candidate for Mayor before approximately one hundred fifty family and friends at a reception held at the Amber Room Colonnade. 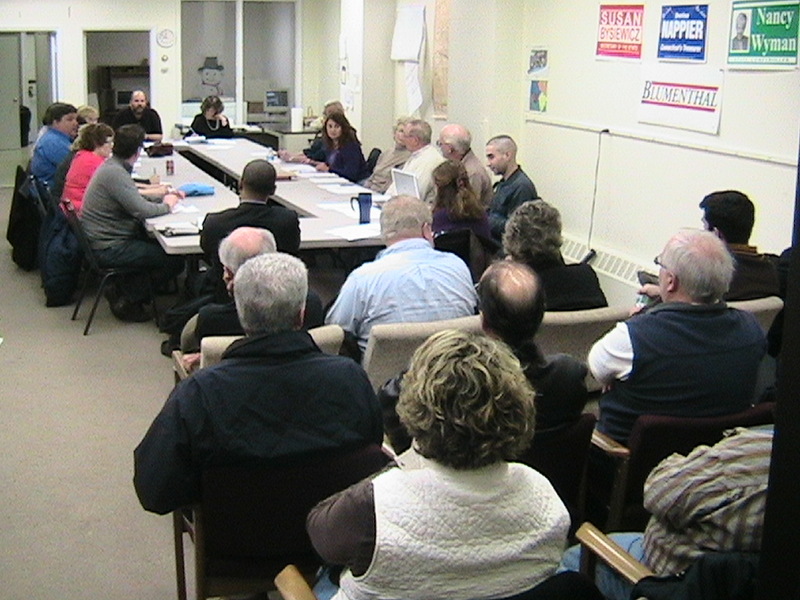 On Monday, March 9th, Mr. Goncalves addressed the Democratic Town Committee where he was warmly greeted as he formally announced his desire to be the Democratic Party nominee as the Mayoral candidate. Mr. Goncalves stated he is running to address the pressing issues that the citizens of Danbury face from increasing taxes and fees to decreased services, to potential teacher layoffs and growing concern for our community’s overall quality of life. Mr. Goncalves further stated that the city's current administration has a clear "tax and spend" mindset that is neither in keeping with the current economic climate nor in the best interests of the future stability and security of the finances and services of the city. He believes that his community, professional and corporate experience combined with his fiscal discipline will position him well to lead our city as Mayor without burdening current and future generations with increased debt. Mr. Goncalves has already received the support of a number of Democratic Town Committee (DTC) members and elected officials well ahead of official DTC candidate endorsements which occur in July. Mr. Goncalves now will begin his campaign on a citywide basis. In the months that follow, he will reach out and solicit input from all the diverse constituencies in the city and add their issues, concerns and voices to his campaign commensurately. Gary Goncalves is fifty-five years old, a native of Danbury who attended our public schools. He received his Bachelor's Degree from the University of Bridgeport. He is married with three children. Mr. Goncalves is currently entering his 30th year of service for the General Reinsurance Company in Stamford where he works as Vice President in the Global Finance Department (General Re is the world's premier reinsurer, and a member of Warren Buffet's Berkshire Hathaway Group). He has been active in a variety of community and church affairs through the years as a volunteer coaching youth sports, leading non-profit groups, raising scholarship funds, and is currently a member of St. Anthony Parish. In honor of Gov. Rell's incredibly dishonest budget which has been blasted on various state blogs, a member of My Left Nutmeg put together this video that highlights our governor's gross malfeasance. Tomorrow, I'll post my report on tonight's Democratic town Committee meeting where the person who will challenge Mayor Boughton officially jumped into the mayoral race. The state’s defense industry may have suffered a setback Thursday, but the Republican Party might have gained a strong challenger to 5th District incumbent, Democrat Congressman Chris Murphy. When Farmington resident Justin Bernier resigned as executive director of the state’s Office of Military Affairs, Connecticut’s defense industry and infrastructure lost a military-friendly advocate. In his resignation letter, Bernier did not reveal why he was resigning a post created in 2007 by the state legislature. However, Bernier talked to The Herald Friday about his resignation. He is considering a run against Murphy in the 5th District and wants to begin building support for his campaign. A tad bit off topic but given the state of the economy, this is required viewing.